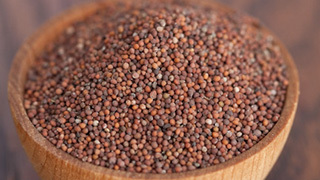 Canada is the world's largest producer of pure mustard seed, accounting for an average 28% of the world crop. Most of that is used as a spice or condiment, but some could soon be used to power jetliners. Australian flag carrier Qantas has inked a partnership deal with Canadian firm Agrisoma Biosciences for a homegrown supply of biofuel after successful trials growing the 'Ethiopian mustard' oil seed crop in Queensland and South Australia. One of Qantas' new Boeing 787-9 Dreamliner jets taking flight for Los Angeles will soon become be first powered with a 30% mix of cleaner aviation fuel made from ground mustard seeds. Qantas claims the biofuel will cut emissions by 20%. Qantas International chief executive Alison Webster says the airline hopes to grow up to 400,000 hectares of the seed, producing about 200 million litres of biofuel per year. In more good news, the leftovers from the pressed seed can be used as animal feed. "This will support the development of a renewable jetfuel supply and bio-refinery in Australia to power our fleet and further reduce carbon emissions across our operations," Webster said. Agrisoma chief executive Steve Fabijanski said: "This is really quite a forward-thinking exercise to have an airline going all the way back to the farmers and saying how this supply chain is going to work." We hope this idea cuts the mustard of course, but please, save some of the yellow stuff for our hot dogs.